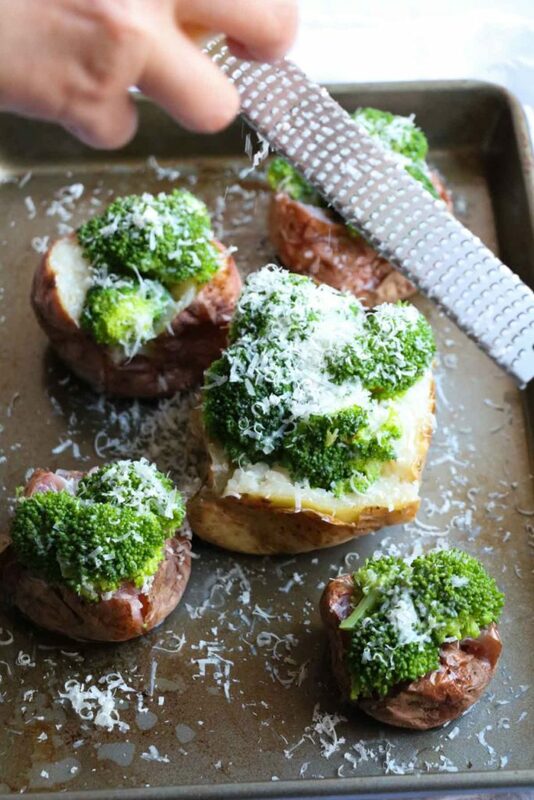 Parmesan Broccoli Loaded Baked Potato. 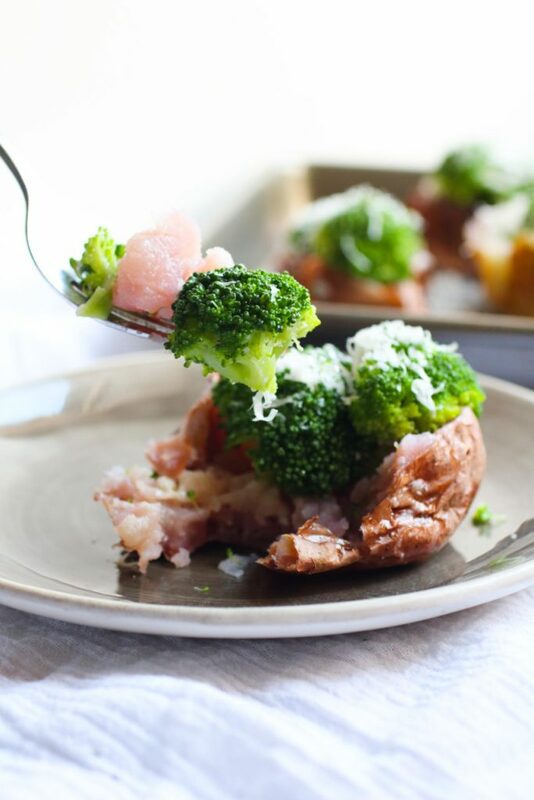 A quick and healthy recipe using only 3 ingredients, broccoli, potato, and parmesan cheese. 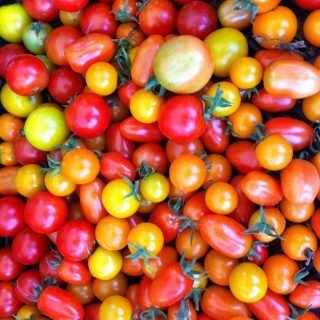 You can eat it as a side dish or the main event. 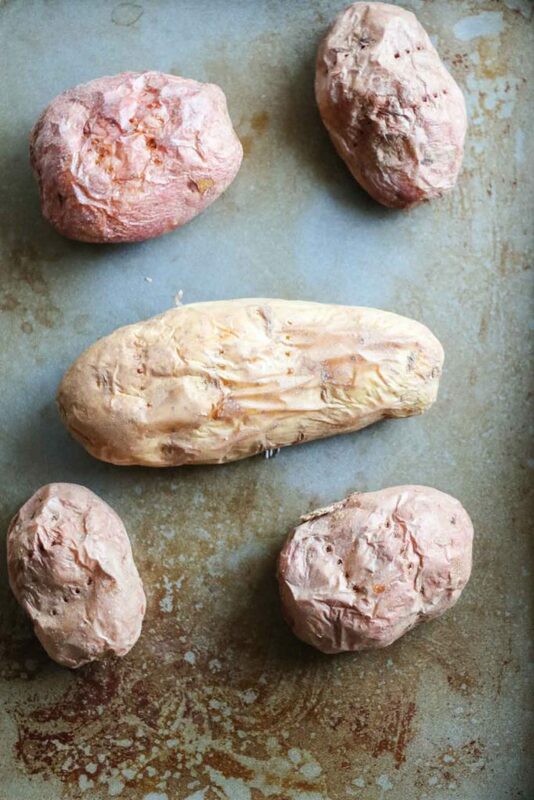 I LOVE this recipe and have it at least once per week! I will always be the biggest cheerleader for stretching your culinary boundaries, trying new flavors, new spices, new vegetables. Spending more time in the kitchen, playing and creating. 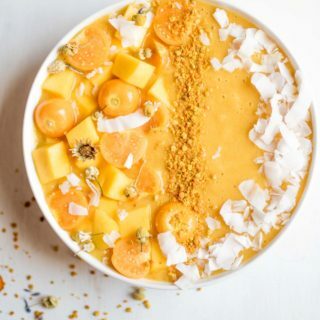 I will always be the biggest and loudest cheerleader for becoming a true goddess in your kitchen because cooking, really cooking, is how I healed my very broken relationship with food. It’s exactly why I do the work that I do, it’s the reason behind the reason. But every week has a night (or two or three) when time isn’t on your side, obligations are extreme, and you just need to eat something. When creativity isn’t the goal, quick nourishment is. When that loud obnoxious “just order take out” voice is really nagging you, but you absolutely don’t feel like or really want to eat take out food. That’s when I make a quick bite. I have a few recipes (dare I even call them recipes) that are favorites in my life, that I make frequently, without fuss, and eat gratefully. 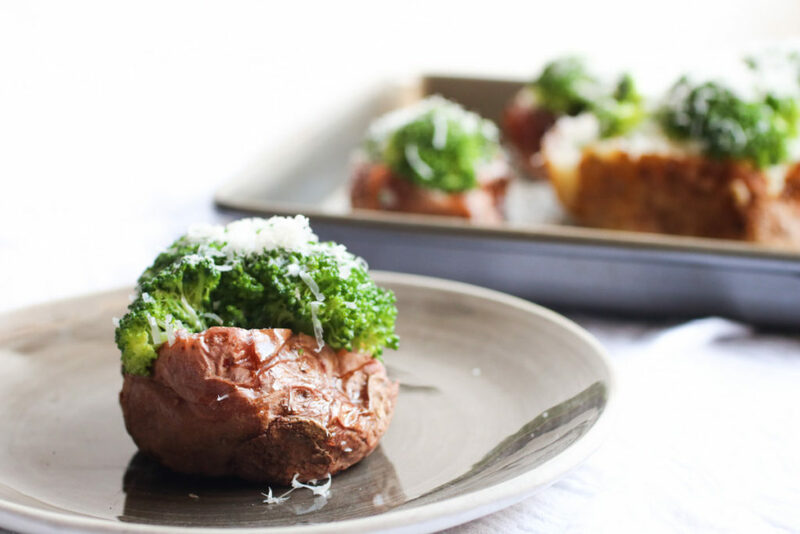 Parmesan broccoli loaded baked potatoes are my recent favorite. This isn’t a recipe that will win a creativity award, but gosh sometimes the simplest food is just so good. I had a night this week, you know A NIGHT. A long day, leading into a longer night. I had just finished my 8th client session for the day, had 2 papers due for school by midnight, I was fried and tired. Jordan and I spent last weekend at my Mom’s in Pennsylvania (birthday weekend, woop! woop!) but that meant no meal planning before the week started. My trusty CSA was delivered on Tuesday and we received gorgeous purple potatoes (and a few white potatoes) and a big head of broccoli. Parmigiano Reggiano cheese is a staple in my house, so that’s always an easy add to any dish. That was it, 3 ingredients (well 4 if you count the butter) and I had the yummiest simple supper. The point is that sometimes dinner can be less than perfect. It can be simple and humble and still taste super yummy and feel utterly nourishing. Sometimes food can be a quick bite and that quick bite can serve you well. 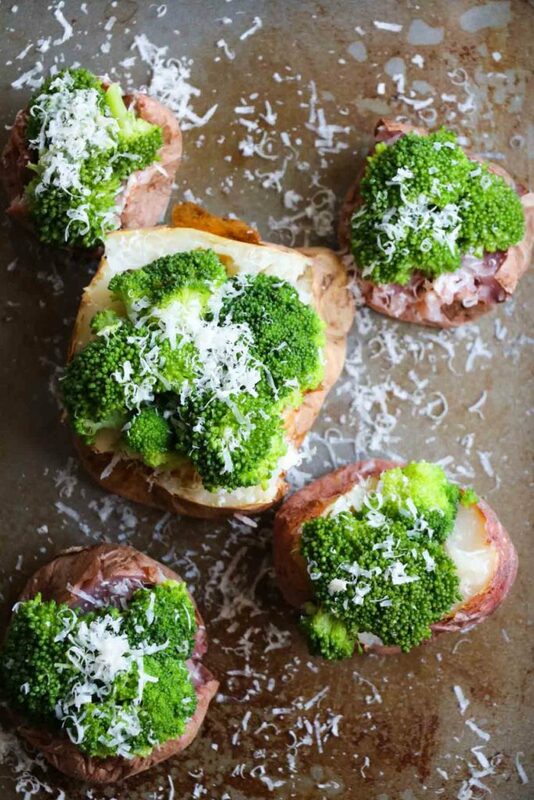 Parmesan Broccoli Loaded Baked Potato. 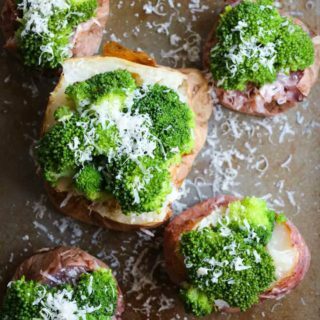 A quick and healthy recipe using only 3 ingredients, broccoli, potato, and parmesan cheese. When potatoes are done, split open fork mash with 1/2 tbsp butter per potato, top with steamed broccoli and sprinkle with cheese. Season with a tiny pinch of sea salt and a generous amount of freshly ground black pepper.